Czechoslovakian Wolfdog - A Real Wolf To Share Your Home? You are here: Home / Breeds / Czechoslovakian Wolfdog – A Real Wolf To Share Your Home? Welcome to our complete guide to the Czechoslovakian Wolfdog! Are you considering this breed as a companion? Keep reading to find out if this is the dog for you! The Czechoslovakian Wolfdog goes by a number of names. These include: Czech Wolfdog, Czechoslovakian Wolfhound, Czechoslovakian Vlcak, and others. This is a powerful, intelligent and alert breed that makes for an excellent working dog. As a pet the Czech Wolfdog temperament is extremely loyal and protective. They can make good pets for the right kind of people. Having said that, they are not recommended for first-time dog owners. Let’s begin with the origin of this proud, beautiful breed. The Czechoslovakian Vlcak, as it’s known in its origin country, was bred in the 1950’s. Border patrol operations utilized these dogs in what was then a communist Czechoslovakia. Czechoslovakia is no longer a country. The Czech Republic and Slovakia are now two separate countries. However, the Wolfdog keeps its original namesake nonetheless. The parent breeds of the wolfdog are thought to be the German Shepherd and the Carpathian Wolf. The original Czechoslovakian Wolfdog breeders set out to create a unique breed. They wanted a dog with the strength and stamina of a wolf. Not only that, they also wanted the trainability and loyal temperament of the German Shepherd. The first recorded generation of Czech Wolfdogs were quite difficult to train. So, breeders again crossed the fledgling breed with German Shepherds. They did this to reduce the influence of wolf in the finished bloodline. The Czech Wolfdog we know today has very little wolf blood. It does have just enough to enhance their endurance, navigational skills and hearing. As you can likely guess from the origin breeds, the wolfdog was bred for military usage. They were used by military special operations as attack dogs. They were also used by border patrols and in law enforcement. Since the breed’s origin, the wolfdog has been used in a variety of working roles. These include search and rescue, herding, tracking, hunting, and more. It remains popular as a working dog in both Europe and the United States. The Czech Wolfdog closely resembles a wolf in physical appearance. It’s a strong, alert breed with excellent eyesight, smell, hearing and stamina. Czechoslovakian Wolfdogs are typically a minimum of 45 pounds when full grown, measuring at least 23.5 inches tall. Often they are quite a bit taller than that. Typically they have light yet muscular frames and a lightweight body. They have a lean, powerful frame that really shows their wolf ancestry. Large wolfdogs can range up to 90 pounds, but this is fairly rare. 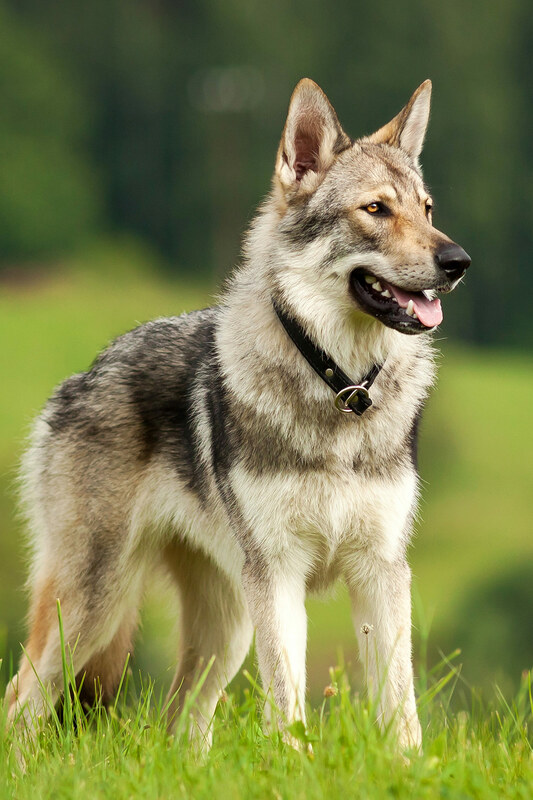 The coat of the Czech Wolfdog closely resembles a wild wolf. They have a rugged, outdoorsy, wild look to them that’s unmistakable. Their coat is thick and straight, designed by nature to protect them from the cold and wind. They are extremely sturdy dogs, able to withstand extreme cold and harsh conditions – although they do not like hot weather. The coat of the wolfdog is usually a mix of white, grey, brown and black, with distinctive layering. The muzzle is often white, with top of the head typically being a grey/brown mix. The Czech Wolfdog is the result of crossbreeding a very high-energy domestic breed (German Shepherd) with a wild animal (wolf). As you can guess, this results in a high-energy, strong, potentially dangerous breed. Wolfdogs require frequent exercise and mental stimulation. Completing tasks and having a job to do is important for them. They are not content simply being left to run around a yard unattended. They need frequent active engagement with their human companions. The Czech Wolfdog temperament is defined by their extremely alert nature. They draw on their superior eyesight, smell and hearing to keep fully aware of their surroundings at all times. They can make for great watch dogs. Although they typically do not bark unless they are trained to do so. The wolfdog is most happy when it’s given a job to do. Without a job or at least regular intense exercise, they can become destructive and frustrated. They also enjoy working in teams, whether with other dogs or with humans. When properly socialized and trained, wolfdogs can make for very loyal pets. Keep in mind that this breed has wild animal DNA bred into it. Caution must be advised. Wolfdogs usually do not attack or bite unless provoked but they can have a wild streak to them. Czech Wolfdogs can be aggressive towards other dogs, particularly if they are not properly socialized. They also have a natural hunting instinct and a strong prey drive. This can lead to run-ins with small animals and other pets. In some cases, Wolfdogs have been known to attack humans. In fact, 14 deaths were attributed to the breed between 1979 and 1998. Some states and city governments even ban the possession of wolf-dog hybrids for this reason. We encourage potential owners to research laws in their area, checking with both state, city and county regulations. Beyond that, we encourage a careful consideration of all the risks involved in owning this breed. Because of their inherent wild instincts and potentially aggressive nature, it’s important to proceed with caution with this breed. That’s not to say they can’t make good pets. However, only very responsible, experienced and active owners should consider the Wolfdog. The Czech wolfhound is a very intelligent breed that can be successfully taught a huge range of behaviors. However, this is not a breed that is easy to train. Positive reinforcement is essential, as the Vlcak can have a very stubborn personality, and bores easily. Wolfdog puppies need training and socialization from a young age. This is of utmost importance with this breed as to reduce it’s wolf like qualities. In short, this can be tricky dog to train and is not recommended for first-time owners. Czech Wolfdogs have a unique coat that is thick and weather resistant. It naturally cleans itself of dirt, so they seldom need a bath. They do not typically have much body odor, and are a clean breed in general. The wolfdog has two distinct coats: a thick winter coat and a thinner summer coat. During transition times, they shed profusely and will require daily brushing. For most of the year, however, a weekly brushing will suffice. Other grooming requirements include regular nail trimming (nails grow very quickly with this breed) and regular tooth brushing. Ears should also be checked bi-weekly to monitor for a buildup of wax or debris. Overall, the Czech wolfhound is a very hardy breed with minimal hereditary health issues. As with any dog breed, certain health issues are of course possible. Typically, wolfdogs are very healthy in general. 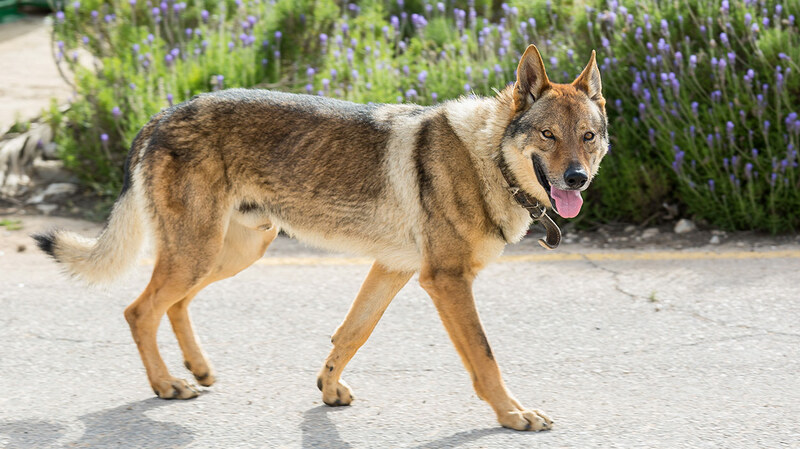 One health concern that is relatively common in wolfdogs is hip dysplasia. This is common in dogs of this size across most breeds. Another issue is pituitary dwarfism. This is a deficiency in growth hormone that leads to an abnormally small body. There have been other, uncommon, health issues reported in this breed. These include elbow dysplasia, dietary issues, malnutrition, seizure disorder, eye problems and cardiac problems. If you purchase Czech Wolfdog puppies from a reputable breeder, it is typically possible to ask to see any health certifications the breeder has obtained. Breeders may test with the Orthopedic Foundation for Animals, the Canine Eye Registration Foundation and others. The ideal home for this active breed is somewhere with lots of space, ideally with a fenced in yard. The home should be free of other small animals to avoid conflict. If you have small children, caution is advised. Wolfdogs are generally affectionate with and protective of children but there is always some risk with this breed. Potential owners should also consider the energy needs of this breed. Wolfdogs are very active dogs. They need regular long walks/runs and ideally some sort of job to do. Wolfdogs can often run 50 miles or more without tiring. This makes them a great companion for long-distance runners and bikers. Any potential owner should also be fully aware of the risks of owning this breed. Wolfdogs have a wild streak and a strong prey drive. This means that owners need to be hyper aware of their dog when around other small animals and children. Do you have your heart set on a Czechoslovakian Wolfdog? Let us know in the comments! Smetanová,et al. From wolves to dogs, and back: Genetic composition of the Czechoslovakian wolfdog. PloS one, 2015. Smith et al. Evaluation of risk factors for degenerative joint disease associated with hip dysplasia in German Shepherd Dogs, Golden Retrievers, Labrador Retrievers, and Rottweilers. Journal of the American Veterinary Medical Association, 2001. Voorbij et al. Pituitary dwarfism in Saarloos and Czechoslovakian wolfdogs is associated with a mutation in LHX3. Journal of veterinary internal medicine, 2014.